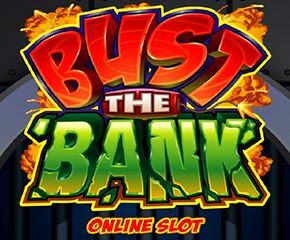 Bust the Bank is an online slot from Microgaming which is based upon the heist theme. It clearly shows how a heist can be a winner if it is done correctly. This online slot has all the necessary elements of an addictive slot including the bonus features. Know more about this slot in this review. 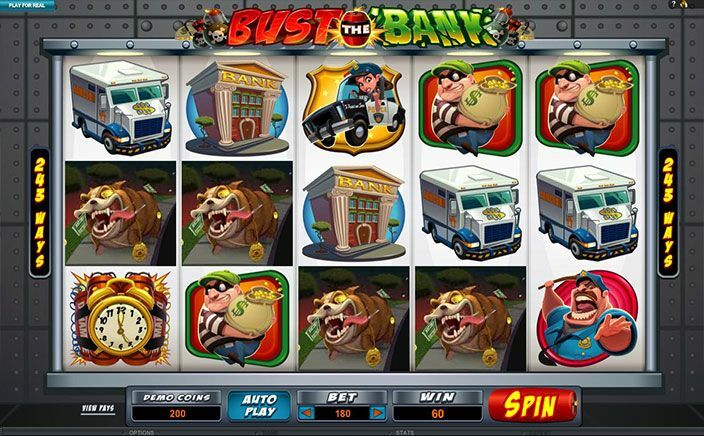 The most important feature of Bust the Bank is that there are not any usual playing card symbols, instead, the slot is designed beautifully with the help of some heist and robbery like pictures that effectively brings in all the action to life. Some of those pictures are that of an explosive alarm clock, a policewoman sitting in a car, police dog, security van, couple of thieves. The wild symbol is the Bust the Bank logo. The slot has five reels to play with which give you a total of 243 different ways to win. In simple words, all it takes is to arrange the matching symbols on adjacent reels for producing a winning combination, hence to get rewarded handsomely. • Safe Bonus – This one is a basically a green safe, sometimes with symbols below the safe. Landing up this the safe in reels five or one can trigger this minor bonus. Once triggered, the safe opens up and coins pour in and depending on the symbols below the safe, an award for each one may be received. • Piggy Bank Bonus – A cash prize is received by smashing a big pig which is flashed anytime when piggy bank is landed upon anywhere on reel 3, triggering this bonus feature. • Larry & Bob – These are the thieves which may randomly appear anywhere on the reels and simply runs away resulting in a bonus amount. • Free Spins – The most important of all the above bonus feature mentioned so far and is triggered by the landing the bomb scatter in reel numbers 3-5. Eight free spins are won upon a trigger and reels 1, as well as 5, are always wild. Moreover, any scatters in this bonus round fetches another extra spin. The rich variety of bonus features along with the action-packed symbols makes this slot the star attraction among players, which players always like to revisit multiple times. The sound effect and animations are matching the exciting slot very well. Try now at Monster Casino.